Posted on January 13, 2013 at 5:45 pm. For the study, researchers at Penn State evaluated how seven categories of risk and protective factors can predict teen alcohol use. Risk factors included antisocial attitudes, antisocial behaviors, association with antisocial peers, and family risk. Protective factors were positive community experiences, positive school experiences and family strengths. A team led by Damon Jones, Ph.D., research assistant professor in the Prevention Research Center for the Promotion of Human Development, analyzed data collected from more than 200,000 students in 8th and 10th grades to predict which factors spurred alcohol use. “We found that when you put all of the major risk and protective factors into the same predictive model, certain risk factors, such as antisocial peer risk, tended to be more highly predictive of alcohol use than other factors, like positive school experiences,” said Jones. The researchers also discovered that individual, family and peer risk factors, as well as the community protective factor, each moderately predicted alcohol use. However, family and school protective factors had less influence than the other factors when all were considered together, the researchers noted. The analysis also showed that the teens’ own antisocial attitudes and friendship with antisocial peers were not as strongly associated with alcohol use when teens reported positive experiences in the community. These findings suggest that positive experiences in the community can help sever the link between risk factors and underage drinking, the researchers said. 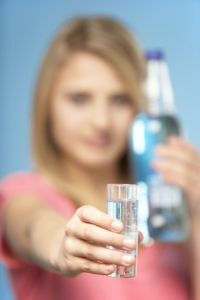 “If we’re talking about teenagers and their initiation of substance use, we want to know which kids are most likely to start using drugs, drinking alcohol or binge drinking,” said Mark Feinberg, Ph.D., research professor in the Prevention Research Center for the Promotion of Human Development who worked on the study. “We want to know if the kids who are most likely to start drinking have risk factors that distinguish them from the rest of the population” in terms of their family life, the peers that they hang out with, their own individual attitudes, and perhaps their own social-emotional adjustment and confidence to manage their emotions and tolerate frustration. The next step is to determine if some risk factors are more important than others, according to Feinberg. “We have already found that the relation of risk and protective factors to underage drinking depends in part on the community a kid is living in,” said Feinberg. The is published in the American Journal of Public Health.